Tomorrow’s Sunday, and in the morning I will go for my weekly run. Dodgy knees allowing, I’ll probably do my favourite 12.5km (8 mile) run. I start from home, turn left down the road and onto the cliff-top. 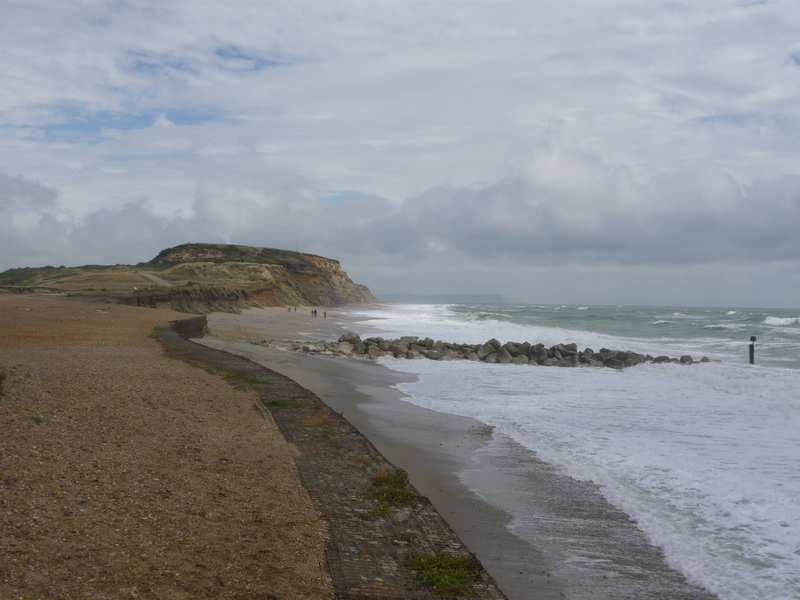 I then head eastwards towards Hengistbury Head, staying on the cliff-top path until it runs out, then a little bit of road-running before I cut across the open land on a sandy path, then a board walk, and then towards Hengistbury Head itself (see photo). The path then joins one of the main tarmac routes over the Head. I loop round through the woods, round the back of a golf course, and return home via the prom. Last week while running this route I was thinking that this run has all the elements of a well-written novel. During this route I run on all sorts of surfaces: tarmac, firm mud path, gravel track, sand, boardwalk. Each surface gives a different feel to the running – rather like a good novelist employs varied pace at different points in the narrative. There’s a lot of different and wonderful scenery, from the broad expansive seascapes to the closed in woodland. I run past a field which sometimes houses rare breeds cattle, past a golf course, past some residential houses. On the way out I’m looking towards the Isle of Wight and on the way back, Purbeck. It’s never a boring run – there is always something different to look at. Just as great novels need different settings to keep a reader’s interest. If you look at the photo you can probably see a tarmac path going up the hill. I start off going up that, then turn off to the left on a mud path which is less well trodden. With some novels you think you know where it’s going and what will happen, and then it veers off in a new, unexpected and much more interesting direction. This path leads into some dark, tangled woodland. At almost half way I pass a point where once I came across police investigating a body that had been found in the woods (tragically, a suicide). Throwing in some surprise and intrigue at the half way point does no novel any harm. Then the path leads me out of the woods and onto the high ground covered with heather and gorse at the end of the headland. The path keeps leading forward but you can see there’s soon no more land, nowhere to go, and it must turn back. Novels, too, reach a point where the narrative needs to begin to resolve itself. My run comes down some steps to sea level, and takes a sharp left on a tarmac path through woods. There are always a lot of people here, walking dogs, cycling, pushing prams. And the occasional land train comes motoring along. I cut off this main path back onto a mud track through woods where I’m usually once more alone. Novels sometimes lull you into a false sense of security by putting the main character in a safe place, surrounded by other people, before once more sending them off on their own again. Then it’s past the half-built visitors’ centre, past the outdoor pursuits centre and along a gravel track behind a golf course. High hedges mean you can’t see much other than your next few steps and there is only one direction to go in. The novel rushes on, the narrative moving relentlessly forward, towards a conclusion which is now inevitable. Finally I come out in the open, back to the prom and home. It’s a longish stretch on the prom – I can see the end of the run from a way out, and enjoy the view across Purbeck and the feeling of a good run finished. This is a novel with a leisurely, drawn out ending where we see the characters settling down into their post-novel lives, all loose ends tied, all sub-plots nicely completed. I end up back where I started, but with a different view (westwards rather than eastwards) and with tired, satisfied legs. I’m not sure whether this post has worked – it all sounded more sensible in my head while I was running, than it did just now trying to write it up. Ah well. If you’ve followed my womagwriter blog for a while you’ll know I’ve a habit of coming up with tortured analogies such as when I likened writing to the Tour de France. Today is my birthday, and it seems as good a day as any to get this new blog started. I began blogging back in 2007 over on womagwriter but that blog has always stayed reasonably tightly focussed on writing fiction for women’s magazines. These days I write novels, so it’s time to start a new blog, about me, my life and my writing. It was the first ever official Bournemouth marathon today, and they had glorious weather for it, although I suspect the participants found it a little too warm. We went to see the start, then I went to the cliff top and watched the faster runners go by, then I went down on the prom and sat on a bench, clapping for an hour or so as the whole field passed. The plan is (and if I put it in writing I’ll have to do it!) to enter the half-marathon next year. 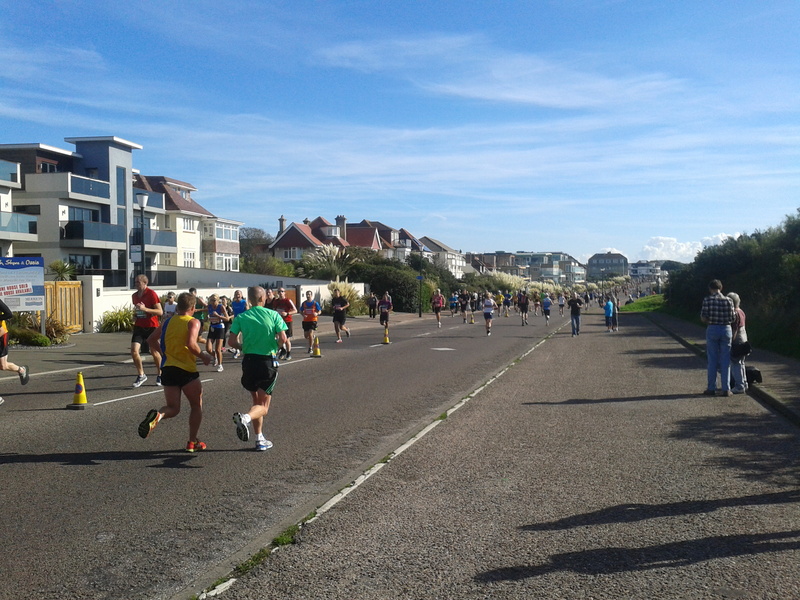 The photo shows some of the front runners on the overcliff, passing the end of our road. Writing a novel is a bit like running a marathon. At the beginning it all seems so daunting – all that distance to cover, all those words to get on a page. But all you have to do is start – put one foot in front of the other, one word after another and eventually you’ll reach the end. (A little training, or practice writing, helps, of course!) Every journey starts with a single step, and every writing project starts with a single word. I’m now in training for next year’s half-marathon. And with this post, I’ve kicked off this new blog. Wish me luck for both!